This aluminum trailer is designed to carry 2-3 boats that together are up to 500 pounds. 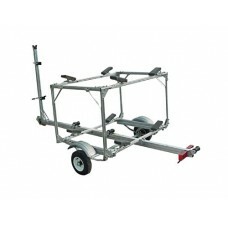 Ideal for hauling laser, sunfish or other similar boats. For almost any boat 15' long and 65" wide with a usable 60" between uprights. All SUT trailers ship in kit form. Trailer comes with a 1 7/8" ball coupler.